All businesses want to better understand their customers - their needs, their behaviour and the frustrations they face when dealing with an organisation. 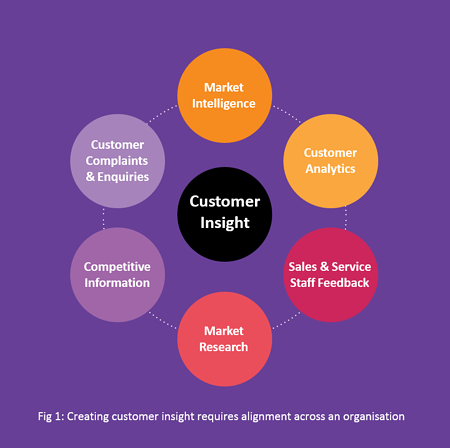 Customer insight comes from compiling and combining data, from a range of different sources, to paint a picture (see figure 1 below). But for analysis of this data to actually be considered insightful, it has to be useful in some way. Certainly, analysis that reveals something interesting about a customer might tickle the brain, but what value is it really adding? True customer insight must go beyond showing something interesting, to showing how a business can actually use that information to better connect its brand with its customers. Insight should drive the company’s organisational thinking and decision-making. How can we actually create customer insight? From a reasonably simple statement — the desire to understand customers and gain insight — unfolds the complexity of delivering it. The creation of customer insight should not be left to a small, tactical initiative undertaken by a team working in isolation from the business. Instead, it requires an alignment between multiple departments of a business — IT, marketing, analysis, product, operations and customer services — across its organisational goals and investment in people, technology, systems and processes. The ‘insight’ comes from modelling what the ROI would have been had the knowledge gained been applied to the original campaign. That is, applying what you know now and arming marketing with the facts to confidently continue with offers A and B — and perhaps identify another appropriate offer C for non-responder. Want to learn more about creating customer insight? 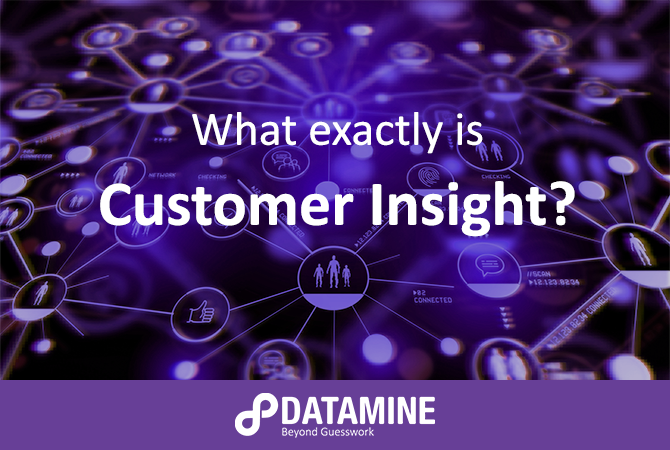 This post is sourced from The Datamine Guide To Creating Customer Insight, which you can download for free below. The Guide introduces what is meant by customer insight and lays out the building blocks for creating it, the skills required to create an effective insights team — and details some of the commonly used analysis techniques for uncovering insights in data.